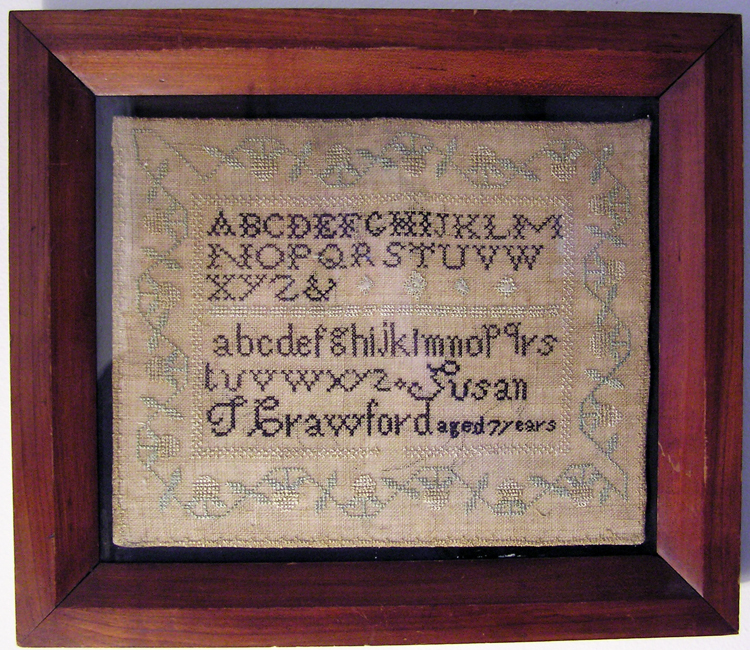 Susan T. Crawford was only 7 years old when she stitched her sampler in the year 1826, in Lincoln County, Maine. It’s worked in soft tones of green, gold and cream with rich chocolate brown lettering and a classic strawberry motif border. Young Susan used silk threads on light brown natural linen with mostly cross stitches plus accents worked in satin and eyelet stitch. The colors appear slightly but harmoniously faded and there are no holes, missing stitches or other damage. There are some areas of reflection on the photo. The needlework has been folded around a mounting board– the sight area is 9-1/2″ by 12.” The lovely old wood frame measures 14″ by 16″ and is in very good condition, ready to hang. Susan Timmons Crawford was born March 30th, 1819 in Georgetown, Lincoln County, Maine to James Grace Crawford and Margaret Miller Rogers.